At our house, we have a lot of rules. 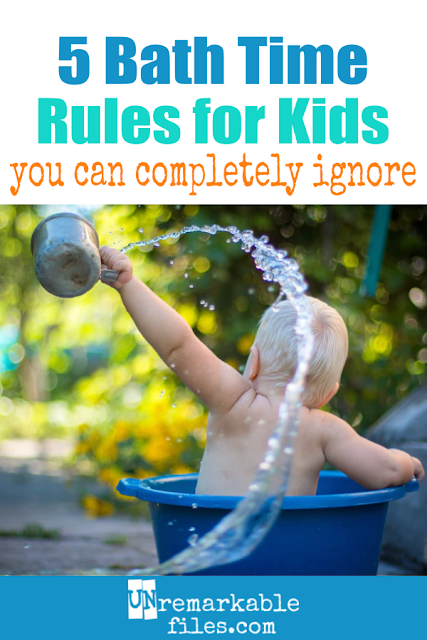 There are rules about chores and food and screen time. I'd consider myself a strict-ish parent, and I'm sure my kids would agree. But there is one area where our family seems to break almost all the rules, and that is bath time. You see, I think many of the "rules" of bath time make absolutely no sense, and never have. And therefore we disregard just about all of them. Setting aside the fact that if we gave daily baths to all 6 of our kids we'd have a water bill that rivals the national debt and single-handedly be responsible for killing the whales, I just don't see the point. Little kids are spot-cleaned as necessary all day long, meaning that unless they're smelly or covered in actual dirt I won't bother filling up the bathtub. That means until puberty at least, baths in our house work out to once or twice a week (more frequently in the summer when kids are outside getting truly filthy.) Maybe it's my aversion to cleaning schedules in general, but I don't believe in The Daily Bath just because. For my kids, bath time = playtime. There's nothing even remotely calming about any activity they perform in the tub. I've seen three stooges who are more chill than my three youngest in the bath, who egg each other on until the whole thing resembles either a demonic possession or a stampede at Wal-Mart on Black Friday. Many times I've wondered as I sat in the bathroom supervising my kids' bath, completely drenched and cowering behind a towel, how in the world anyone has the mental fortitude to add the shenanigans of bath time to the already long and exhausting process that is getting kids to bed. I certainly don't. Rule #3: Fun Tub Toys for Everyone! Um, no. We used to have bath toys and a special bag suction cupped to the wall of the shower to theoretically let them drip-dry. In actuality, it was a glorified mesh mold factory that made me gag so hard I think I saw my own intestines once. I'm one of the least germophobic people I know, but the thought of those grody toys climbing aboard the Toddler Hands Express and embarking on a non-stop trip to Mouthville was more than I could handle. I threw everything out and now their baths toys are limited to: bubble bath, colored bath drops, and whatever kitchen utensils I can put in the dishwasher afterward. I know some parents are super-eager to get their kid in the real tub as soon as they can sit up but I ask you: WHY. I never enjoyed kneeling on the tile floor and to be honest, it always felt like a gigantic waste of water to fill a tub for someone barely bigger than a hubbard squash. I figure if I wash my produce in the sink, I might as well put my babies and toddlers in there until they're no longer vegetable-sized. There are specialty baby washcloths, hooded towels, baby body wash, no-tears shampoo, kid bath visors, and foam faucet covers shaped like humpback whales. To which I say, huh? I admit we once had some of those things from my first baby shower, back when we actually thought you needed half of Babies 'R Us to raise an infant, and sure, we use up the travel-sized bottle of Johnson's that comes home in the maternity ward swag bag. But for the most part we just use products from our shower and bathroom cupboards, and the kids seem to be surviving. If you love giving your kids nightly baths or if you're a traveling rubber ducky salesman, that's totally fine! Your house, your rules. But for those of you who secretly hate these bath time rules and follow them anyway because you think you're supposed to, I'm giving you permission right now to stop. You'll be in good company. Wow...our bath rules are nearly identical. Threw out our final moldy rubber ducky several years ago. My mom used to guilt trip me about not bathing the kids every single day, but I just can't. Baths here happen twice a week only for those who can't shower by themselves (unless there is a major diaper mess). My goal is to get them clean and get them out before they get too crazy, not to encourage the craziness! Yes to all of these! I can't understand the people who bathe their young children every single night. Like, I actually can't understand how that happens in a way where everyone keeps his or her sanity haha. We don't even have a schedule for baths, it's more of an "as needed" kind of thing, which usually winds up being once a week I think? I've seen a book at the library before about how dirt is good for kids, and I kind of want to read it for validation sometime :P My toddler's only "bath toy" is a small plastic bowl and he seems to be just fine with that! (he does own rubber duckies, but he has not yet learned that people actually put those in the bath tub-they live in the toy box instead) He also loves his fizzy color drops which someone gave him as a present, though now that he's used almost all of them, I think I'll make a batch since apparently they are easy and cheap to create. Oh, and hooded towels? Um, nope. Someone gave us a hooded towel as a baby present, and I think he's used it all of one time ever. It's just too thin (why are baby towels always so thin???) to be practical, and our big bath towels work just fine. Not sure if it's the same one, but I read a book called Let Them Eat Dirt for the same reason, but it was kind of a misleading title, since most of it applied to what you can do for a child's gut bacteria in pregnancy, birth, and maybe up to the first year. Eating dirt doesn't happen until later, mainly, in my experience. Must be something about have 6 kids. No time for any of it!